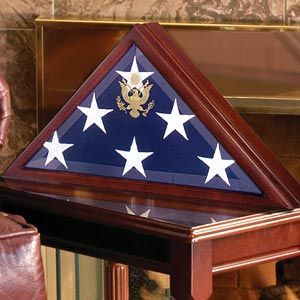 The Military Burial flag case is sure to become a treasured keepsake for generations to come. The hand rubbed walnut finish, beveled glass front, and great seal of the United States completes the look of this Burial flag case which creates a proper memorial for your loved one�s tribute of their military service. The Burial Flag case can be proudly displayed in any home and comes complete with wall mountable hardware.